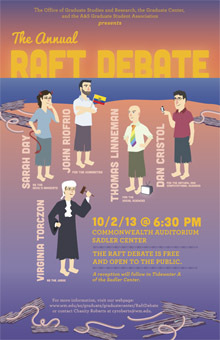 The Raft Debate, a much beloved William and Mary tradition, will be held in the Sadler Center's Commonwealth Auditorium on Oct. 2 at 6:30 p.m. The three survivors of an imaginary shipwreck, a scientist, a social scientist, and a humanist, achieve a delicate balance between comedy and lecture as they debate the value of their respective discipline for the rest of humanity. Only one of these professors can return to civilization in the life raft. A fourth faculty member, a Devil’s Advocate, joins the survivors and argues sarcastically that none of the academic disciplines are worth saving. The winner of the debate is chosen by a judge based on audience reaction. Faculty, staff, students and community members are invited to join the excitement as the professors cajole, plead, pontificate and resort shamelessly to props and costumes until the final, lone survivor, is decided. Humanities: Assistant Professor John Riofrio, Hispanic studies. Riofrio's research focuses on U.S. Latinos and immigration from the Americas to the United States. In particular, Rio's work deals with how representation of Latinos in popular discourse and popular media impact their reception in U.S. society. His work also covers Latino responses via cultural products like literature, film, music and media. In addition to numerous articles on Latino immigration and representation, Rio is at work on a manuscript entitled "Continental Shifts: Migration, Representation and the Search for Justice in Latin(o) America." Riofrio is the father of two elementary-aged children and two older step-daughters. He is a former college soccer player who now specializes in eating cupcakes, especially coconut ones. Social Sciences: Associate Professor Thomas Linneman, sociology. Linneman served as chair of the Department of Sociology from 2006 to 2011. Besides his current "Principles of Sociology" course, he teaches social statistics, a course on social movements and social change and a senior seminar on sexualities. The second edition of his statistics textbook Social Statistics: Managing Data, Conducting Analyses, Presenting Results, will be released by Routledge in 2014. At William & Mary, he serves as faculty mentor for Mosaic House, runs the Sociology Film Series and was named the College's Advisor of the Year in 2012. His research concerns such topics as media, religion, sexualities, gender and language. He is currently the editor of the Trends section for the American Sociological Association magazine Contexts. The devil's advocate will be played by Associate Professor Sarah Day of the mathematics department. Day's research in the areas of computational dynamics and topology focuses on developing tools for studying complex systems from medicine, ecology, materials sciences and other scientific disciplines. She is an active participant in William & Mary's Biomathematics Initiative and enjoys working with students with varying interests and backgrounds both in the classroom and on research projects. Off campus, Day enjoys playing Devil's Advocate with her daughters in an often futile attempt to get them to acknowledge the importance of sleep. The judge will be played by Virginia Torczon, dean of graduate studies and research in Arts & Sciences. The Raft Debate, sponsored by the Office of Graduate Studies and Research, the Graduate Center and the A&S Graduate Student Association, is free and open to the public. A reception will follow in the Tidewater A of the Sadler Center. For more information, visit the event's webpage or contact Chasity Roberts at cyroberts@wm.edu.